Practice is the only way to build a consistent, repeatable golf swing. There's always something to improve on, no matter how skilled you are at something. Once the beginning golfing skills are mastered, you can spend more time working to fix and fine-tune the details that are affecting your game. It's surprising how much small things that are being done incorrectly can affect your swing and your overall game By learning what these things are, you can avoid them and become a better golfer. For a golfer to shank is mortifying, and many golfers even try to say "shark" to avoid this word altogether. A shank is when the ball shoots off harshly in a direction other than where you were aiming, because it makes contact with the hosel of the club instead of the clubface. It happens to everyone, from pros to novices. To avoid this mishit as much as possible, learn to "hit" the ball rather than "push" it. When you push the ball, it makes contact with the wrong parts of the club and will not go in the direction you want it to. 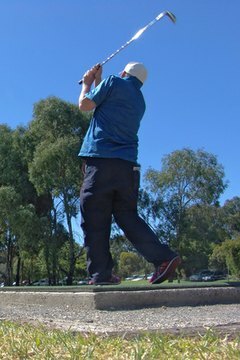 Many golfers sway to shift their weight as they go to hit the ball. This, however, is unnecessary, as your body naturally shifts its weight when you rotate your core. Swaying will throw off your balance, and you will lose the power and control behind your swing. You should turn your upper body, not sway your whole body. The way you grip the club can have a crucial effect on your swing, and a proper grip can greatly reduce the chance of mishits. Make sure your grip is loose and relaxed so you can maintain your rhythm and balance. Turning the shaft counter-clockwise will further a slice shot, while turning it clockwise will promote a hook shot. Betty Russell has been a freelance writer for 16 years. She has written for a variety of healthcare publications, and had articles published in The Boston Globe. Previously, Betty was a television news anchor, radio announcer and public relations specialist. She is a graduate of the University of Colorado where she earned a bachelor of arts degree.